Daily Success 4/20/2013 – I abusing my body, for the past 20 years, I allowed others to abuse me as well. Standing at only 5 feet 5 inches tall, and weighing 223 pounds takes a lot of work. But unfortunately, it was a lot of destructive work. I ate whatever was in front of me (which was almost always junk), smoked a pack a day, and had a non-functioning thyroid. I became a self-employed photographer who tethered myself to home, grocery shopped at 2 a.m. to ensure I wouldn’t run into anyone I knew, removed all the mirrors in my place and would dodge my reflection in windows like a stalker was on my trail. So not only was I abusing my body, for the past 20 years, I allowed others to abuse me as well. I was in one abusive relationship after the other. Emotionally paralyzed and disgusted with my body, I truly believed I had missed my chance at a healthy life. Night after night, I’d wake at 4 a.m. to the flickering of the TV filled with healthy and happy people working out and talking about transforming their lives. I’d watch with envy, wishing I was one of them. Then a friend posted on Facebook that she was recruiting people to join her Beachbody Challenge Group and said: “Healthy People Attract Healthy Relationships.” Not only did I want to be healthy, more than anything I wanted a finally have a healthy relationship. So I signed up—determined to lose weight and change my life. Turbo Jam was hard, and at first I could barely do any of the moves. But Chalene kept saying, “JUST KEEP MOVING, it’s ok”—it was as if she saw me struggling and encouraged me at the exact moment I wanted to quit. When the videos were over I’d pull out the cards and practice the moves very slowly. Chalene stressed it was more about technique than how high you kick, so I kept moving, and kept trying. On the days I didn’t do the videos, I’d walk, bike, kayak, or just dance around my house. The more I moved the quicker the fat melted away. Over the past year, I’ve quit smoking and ditched the junk. My skin glows, I have tons of energy, my knees and back no longerhurt, and I can even cross my legs like a girl. So far, I’ve lost 55 lbs., 6.5 inches off my hips, 8 inches from my waist, and another 2 inches from each arm and calf. When I look in the mirror, I can’t believe it’s me! Not only did Turbo Jam change my outer shell, but it broke me free of my inner shell and has given me the courage to take control of my life. I’m no longer in a dysfunctional relationship and now only surround myself with positive, happy, and healthy people. It’s crazy how things work, but once I made the conscience effort to try my hardest and believe in myself, everything just fell into place. I don’t know what tomorrow will bring, but I know that whatever comes my way, I’ll be able to handle it. I’m so proud of all my achievements and truly believe that I can do ANYTHING I want. Thanks Beachbody, you saved my life. Daily Success 4/10/2013 – After I had my second baby, the ‘eating for two’ excuse didn’t work anymore. After I had my second baby, the ‘eating for two’ excuse didn’t work anymore. I was miserable. I had gone from overweight to obese. It was so bad, I didn’t even dare to weigh myself. I hated the way I looked. Hated that going up the stairs left me winded. And I hated that people were still asking me if I was pregnant. That hurt the most. Something had to change. And it did one night when I was up with the baby and saw the infomercial for Turbo Jam. It looked like fun. I watched people say how it had changed their lives. And with a money-back guarantee I decided I had nothing to lose and everything to gain. When I started, I was amazed at how much fun working out was. I loved the music. Chalene’s enthusiasm and encouragement kept me motivated. And for the first time in my life, I actually wanted to work out every day!!! Once I started seeing results—that only increased my determination. Even after doing the 20-Minute Turbo Jam tons of times, I still get pumped when it’s time to ‘get on the party train’! Chalene is so sincere that seems to know the best time to say something motivational that will get me pushing hard again even when I’m tired. And guess what? I went from being obese to being healthy—and that’s a wonderful feeling. I lost more than 75 pounds (I can’t say for sure because I was afraid to step on the scale until I had been doing Turbo Jam for a while). I lost 13 inches from my waist alone. And I finally have a waist that’s smaller than my hips! Best of all, I finally feel good about myself. I no longer feel fat and ashamed. Instead, I’m proud that I achieved something I once thought was impossible. Now I know that I can achieve anything I set my mind to do. And I don’t think I could have learned that without Chalene! Daily Success 3/14/2013 – faced some pretty tough times—death of my brother, a divorce, and giving birth when I weighed 307 pounds. Before finding Beachbody, I had faced some pretty tough times—death of my brother, a divorce, and giving birth when I weighed 307 pounds. When I was diagnosed with a cyst that covered 60% of my thyroid, my doctor also said I was pre-diabetic and would need to start taking medication twice a day. I kept thinking, ‘I’m in my 30s—I can’t take a pill every day, forever.’ That’s the minute I knew I had to do something. And here’s the best. I’ve lost 87 lbs. so far. I can breathe. Take no prescribed medication. My blood pressure is normal. When I started, I was wearing a size 24. Now I’m a 14 and wearing larges. And I’m no longer pre-diabetic. What did Challenge Groups give me? Constant accountability. In my Challenge Group, we were all very active. Having a support group and being on a team was certainly one of the key factors for me. Shakeology, too. My doctor asked what I was doing to get such fantastic results, so I made sure to inform her that Shakeology is the key. I am truly a new person. Every day is an active day. I’ve moved on to Les Mills Combat™ and I am still shedding pounds! Daily Success 2/18/2013 – I was literally eating myself into an early grave. Every New Year’s, I would say my New Year’s Resolution was to lose weight. But I never followed through—until this past year. I was a new mother. I was totally overweight. I had no energy, no confidence, and no self-esteem. I had headaches every day. So what would I do? Turn to food. I was literally eating myself into an early grave. Until I made my New Year’s Resolution last year and followed it by starting P90X. I loved that P90X is a routine, sets a schedule so you have something daily to look forward to. It changes daily and it’s fun. Also, the meal plan and recipes kept my eating on track. And when I started adding Shakeology, I gained a ton of energy, could sleep better, and felt like I could focus better. Don’t get me wrong, there were tons of days when I felt like giving up, but being in a Challenge Group helped me keep up—those people were there to support me, give me courage and inspiration. And this time it worked. Thanks to P90X and Shakeology as well as TurboJam and TurboFire, I kept my Resolution. I lost well over 100 lbs. I have more energy, more confidence, I haven’t used pills for my headaches, my body doesn’t hurt anymore, my blood pressure and cholesterol are the best they’ve ever been— and I can run and play with my son without pain! Daily Success 2/15/2013 – I was miserable. And I hated life. I used to spend all my free time glued to the couch—watching TV, reading, or taking naps. I was fat. I was miserable. And I hated life. When my husband asked for a divorce last year, I hated life even more and completely lost my appetite. While starving myself did take off the pounds, one day I woke up and realized that I had to start eating right and exercising if I really wanted to get healthy. And that’s when my journey with Beachbody® began. First I did TurboJam®, which really got my body moving. While I love weight training, I need lots of motivation to do cardio, which Chalene freely gave. This was a great beginner’s workout because it allowed me to see positive results very quickly while getting used to exercising again. Next I gave INSANITY® a shot because I wanted to push myself and see what I was made of! During this time I started running and completed my 1st 5K in May 2012. INSANITY was the ultimate physical challenge—it was just me against my mind—and I was so proud of myself when I completed it. Chalean Extreme® was the third program I chose to conquer. This one was great because it taught me how to lift weights without bulking up. Throughout this program, I continued training for my races, and the day after I ran the half marathon I started the Ultimate Reset®. I chose the Ultimate Reset because even though I’d become an exercise fan over the past year, eating healthy was something I still struggled with. The Reset helped me stop eating sugar and processed foods, which enabled me to sleep so much better at night. And when I started drinking Shakeology® I realized I had found my missing link to nutrition. Shakeology curbed my cravings while giving me the energy I needed to push play everyday. Though it all, my Challenge Groups were key to my success. The Challenge Group gave me the confidence I needed to step outside my comfort zone and achieve my goals. It has been my biggest cheerleader throughout this entire journey and I couldn’t have done it without challenge group support and belief in me! My Challenge Groups were great because they held me accountable each and every day, and were there for me when times got tough—which they did, a lot. After completing all these Beachbody programs, I lost almost 80 lbs., went from wearing a size 16 down to a 4, and wore a bikini this summer for the 1st time in over 20 years. And while my physical achievements are fantastic, I’m most proud of the mental shift I made. I went from a total pessimist to a glass-half-full kind of person, and am totally loving life. 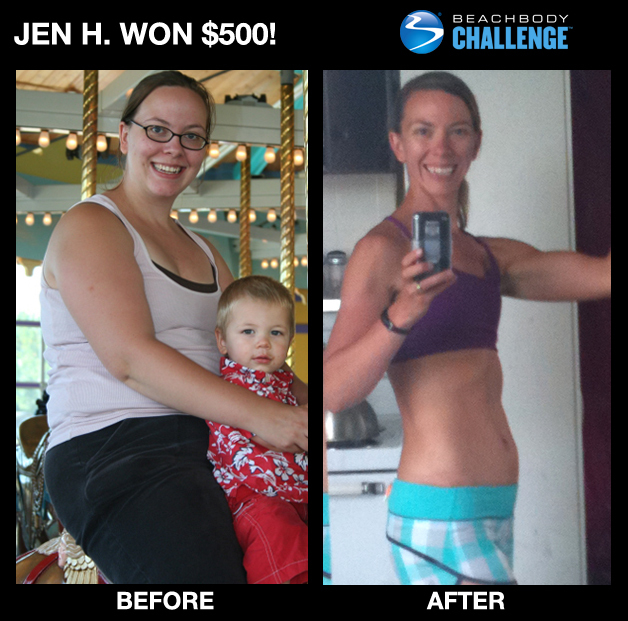 I’ve never felt healthier or happier than I do right now, and I owe it all to Beachbody. Thanks! Daily Success 2/18/2013 – Lifestyle of gorging on fast food, downing Slurpee’s daily, smoking for years, and NEVER, EVER, EVER exercising. In high school I was skinny. After having 2 babies in my twenties, I was not. But really, my weight issues had very little to do with my “baby fat.” Instead, they had everything to do with my lifestyle of gorging on fast food, downing Slurpee’s daily, smoking for years, and NEVER, EVER, EVER exercising. Even though I was tired, depressed, and despised my reflection—sadly, I was completely unmotivated to change. That was, until the day I saw pictures of myself from my husband’s family reunion. Pictures don’t lie. I was fat. The very next day, I saw a TurboJam® infomercial, bought the program, and never looked back. I chose TurboJam simply because it looked fun, and one of the girls in the workouts had lost the amount of weight I desired to lose, so I thought: If she could do it, I can too! And from the very first workout, I fell in love with the program. Chalene was incredibly motivating, the music was fun, and the moves were something I could actually do. So far, I’ve lost 70 lbs. of flab and over 75 inches off of my entire body. I went from a chunky 205 pounds to a lean 135. And from a size 16 to a tiny 2. I lost so much weight that I had to buy a whole new wardrobe because nothing, and I mean NOTHING, fit anymore. I’ve also packed on 20 lbs. of muscle and am in the best shape of my life. I’m now very athletic, completing a half marathon. I competed in 2 Women’s Strength Competitions, and recently won a 10K. I’m a certified personal trainer (for over 4 years now) so I can help others who struggle with exercise and eating healthy. Talk about a 180, wow, what a different life I now have! 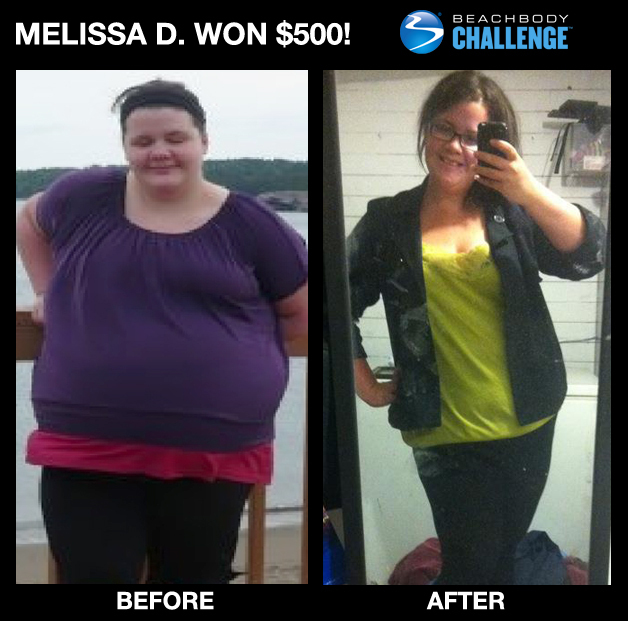 And the truth is, none of this would have been possible without Beachbody. You guys really helped me to completely changed my life. Thank you.